Too hot to turn on the oven? 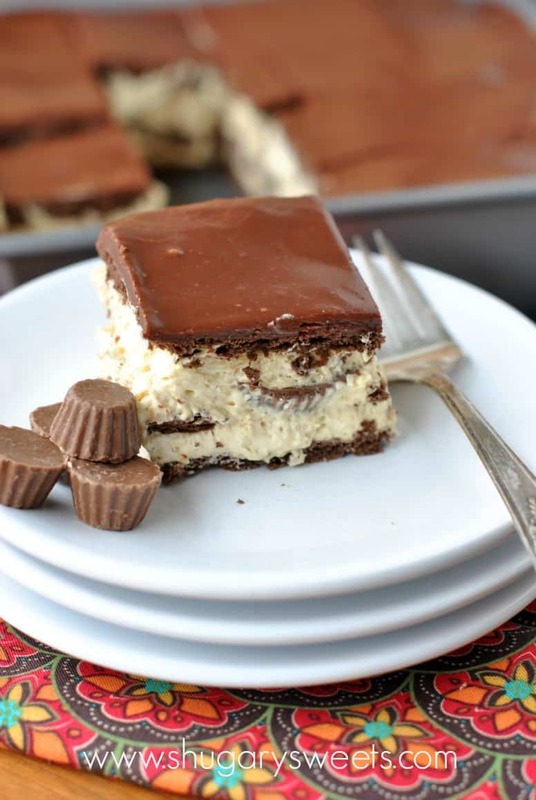 Try making this No Bake Peanut Butter version of a Chocolate Eclair Cake! Sometimes, you, my readers have the best ideas! Last month I shared a Strawberry Eclair Cake recipe. 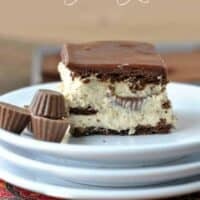 Which is basically a twist on the traditional Eclair Cake. One of you suggested I make a peanut butter version. And I’m so glad you did! I used chocolate graham crackers instead of original honey, which gave a delicious chocolate twist to the cake! I also added peanut butter to the pudding filling. Oh, and some whole Reese’s Peanut Butter cups. 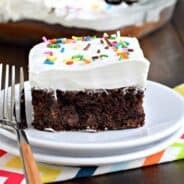 I made a homemade chocolate frosting, but if canned frosting is your thing, go for it! I also scaled this recipe down to a 9inch baking dish instead of a 13×9. It’s quite rich, so you don’t need as large a slice!! One bite of these and you will be so glad you tried this version! Be sure you let this cake sit in the fridge for at least 4 hours (or overnight) to help soften the crackers! It’s an important step, k? Speaking of the homemade frosting, I used one of my new favorite discoveries! TCHO Chocolate. I used their 99% unsweetened chocolate critters. They are so adorable too. But, word of warning, don’t let their cuteness be mistaken as a good snack. They are unsweetened. So unless you like to snack on unsweet chocolate, (NOT ME) don’t pop them in your mouth. However, please please please use these for making delicious smooth and creamy frosting! I’m delighted in how smooth this chocolate melts. As some of you many know, chocolate can be difficult, temperamental product. And you want a good quality chocolate filled with rich creamy flavor, but also a product that melts perfectly. EVERY TIME. 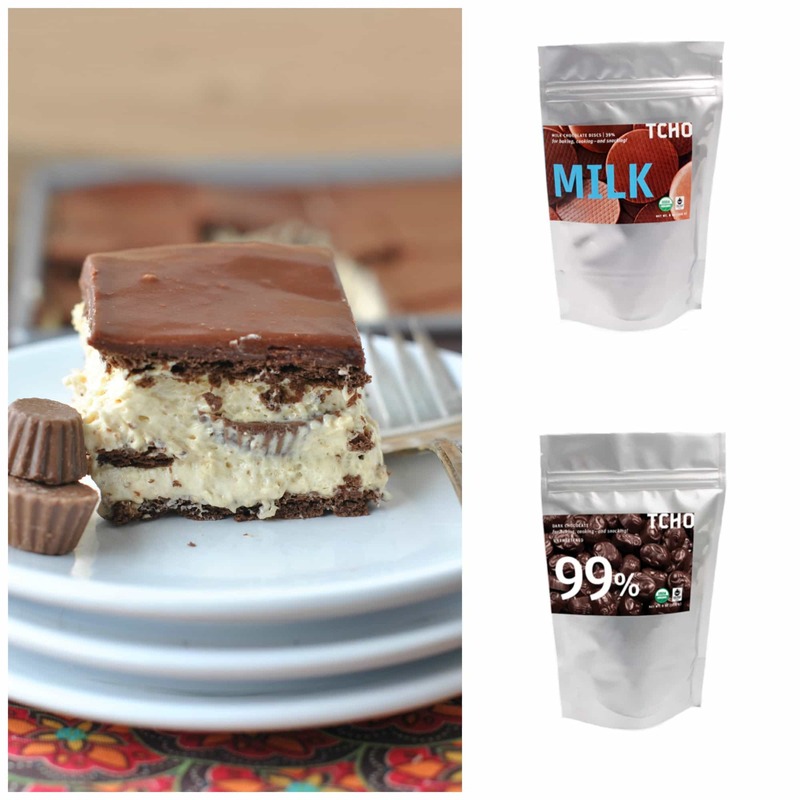 So far, TCHO Chocolate has been that perfect product! TCHO provided me some samples, and I can’t wait to purchase this chocolate on a regular basis. I’ve already used the other samples (dark chocolate and milk chocolate) in upcoming recipes! So stay tuned!! 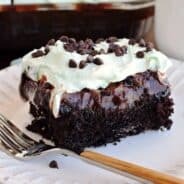 Connect with Shugary Sweets! I know you want to see behind the scenes…check out my instagram! In a large mixing bowl, beat vanilla pudding mix with milk, until there are no lumps. Beat in peanut butter until smooth. Fold in the Cool Whip, set aside. In a 9inch square baking dish, layer 6 grahams. Top with half of the pudding mix. Top with 6 more crackers and the 16 Reese's PB cups. Top with the remaining of the pudding mix. Finish by topping with the remaining 6 graham crackers. For the frosting, heat unsweetened chocolate with butter and corn syrup on medium heat in a small saucepan. Whisk until smooth. Remove from heat and whisk in the powdered sugar and milk. Frost the top of the graham cracker layer and place in refrigerator. Refrigerate for 4 hours or overnight. Cut and enjoy! Looking for more No Bake Recipes? Be sure you follow me on Pinterest! 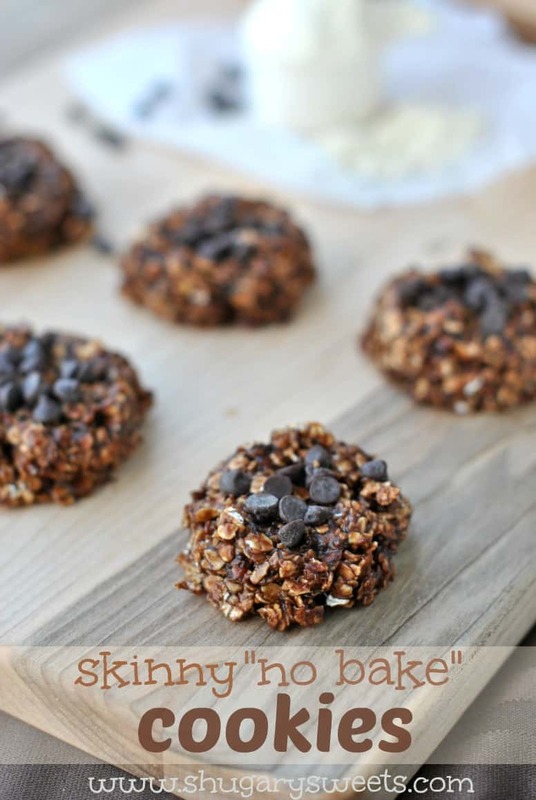 I have a No Bake dessert board which includes these Skinny No Bake Cookies! I had something like this today at a luncheon at church minus the peanut butter. Oh how I bet this is so much better adding it! The peanut butter is a nice addition! I do make a classic version as well (maybe more like what you had today). Both are awesome!!! This looks pretty ridiculous. And that frosting looks silky and beautiful. Can’t wait to try it. I can’t believe how delicious this looks. I am not one for eclairs but I would be more than happy to try this! This looks amazing, Aimee! I love no bake desserts in the summertime! This looks so simple but so incredible! I have to make this! Wow…. this looks amazing! I love no-bake desserts in the summer time. Keeps the heat out of the house. I can go for a slice or two here… YUM! Eclairs have been one of my favorite things since I was a kid. Something about that rich and creamy filling with that chocolate glaze. Yours look SO delicious, and I can never resist peanut butter! Thanks Marcie, it’s hard to resist chocolate and peanut butter!! Holly scraps this looks mighty delicious, but then again, everything you do does 🙂 I wish I could just dig in. I have never had an eclair cake, which is weird because I love eclairs and cake! Must get one into my life. Oh you must try an eclair cake!! they are one of our favorite summer desserts! Wow, I can’t believe a no bake can look that decadent! Gorgeous and so creamy! This is fabulous Aimee! I almost made an eclair cake with the peanut butter poptarts, but did the bars instead. That would have been too funny! That would have been pretty funny!!! You know that I love every single thing about this cake! I’m sitting here drooling at how good I know this must have been! And that chocolate sounds fabulous…I will have to keep an eye out for it! It’s funny although I am not a huge peanut butter fan, I am a fan of resses pb cups and go weak at the knees when I see them!! LOL weird, I know. 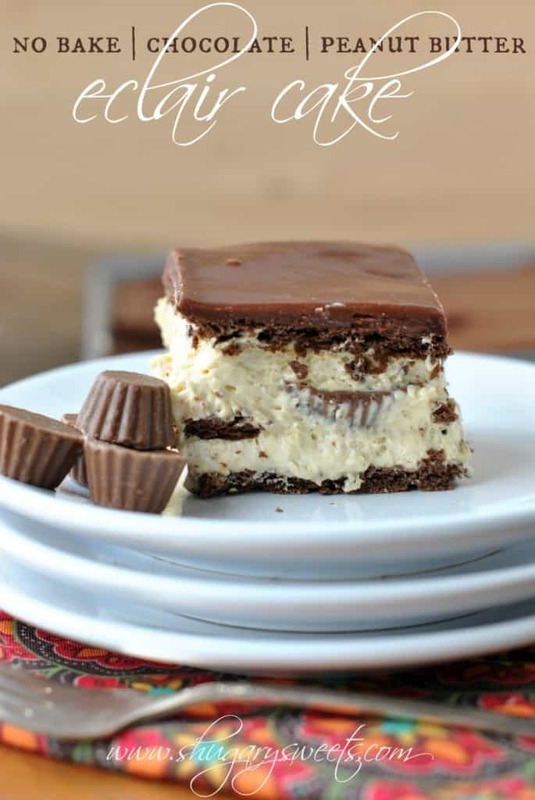 This eclair cake looks fabulous!! How fun is this cake!? I love Eclairs. It’s my go-to dessert when I am out and about, I think because it reminds me of Boston cream donuts! Well, stay turned because I have a delicious Boston Cream Donut recipe coming soon!!!! Oh that is FANTASTIC news! I love eclair cake! I was just thinking the other day about switching up the ingredients to make a different version, thanks for doing all the work for me 😛 I can’t wait to try this! A friend sent me a recipe for a peanut butter eclair cake a while back and I totally didn’t take the hint that she wanted me to make it for her. She’d probably forgive me if I made her this version cuz it has Reese’s in it! Oh boy, this is over the top awesome! Thanks Veronica. I think you totally need to make this for her…win some points!! This looks like a giant, super creamy peanut butter cup- except it’s cake and has peanut butter cups in it, so it’s even better! Love the peanut butter variation! I wish I were eating a big slice right now! 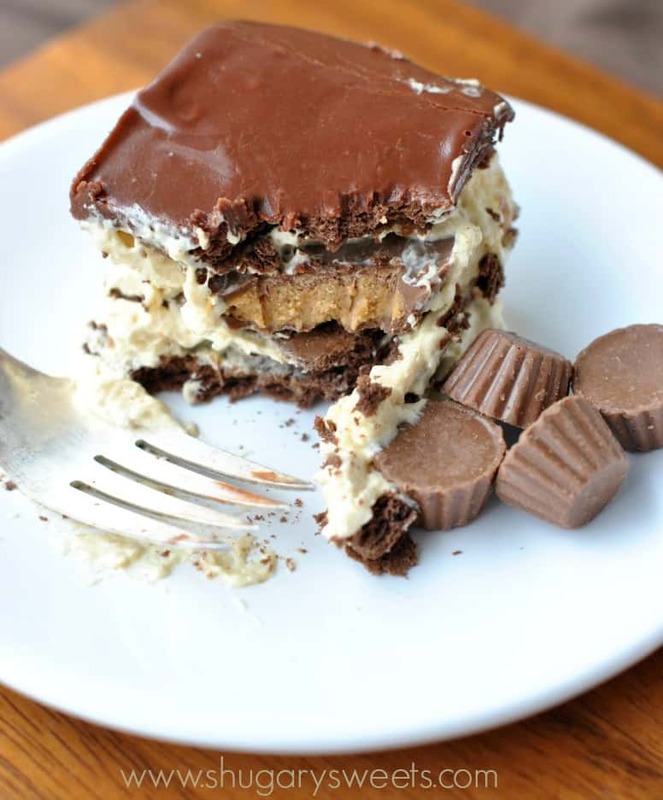 oh wow… i’m all over the peanut butter recipes right now! This is perfect for the summer months when you don’t want to turn on the oven! Love this version with the peanut butter! I bet it tastes fabulous! LOVE anything no bake in the summer and this look fabulous! I don’t even know how to describe how amazing these look! ooooh No Bake Desserts are sooooo dangerous for the simple fact that they are so easy. This looks fantastic! Oh, girl! This no-bake dessert is totally off…the…chain! Love that there is PB in this Éclair Cake! yeah, the richness from the PB is just incredible!! ENJOY!!! MMM I love TCHO and omg I am in looooooooove with these bars. Nothing not awesome about these! YEAH it’s too hot to turn on my oven, and YEAH I want to make this immediately! So glad you have the TCHO love. I’ve enjoyed their chocolate for years, and this post reminded me I need to pick up some more! I wish I had known about TCHO sooner!! It’s very good, I’m on it now though!! Planning on making this tomorrow!! My hubby LOVES Reese’s 🙂 Question, are you using bite sized resees or the normal, larger sized ones? How would I turn this into a 9 x 13 size dessert? This turned out deliciously! I made two batches yesterday morning, one for a party in the afternoon and another for a party today. Thanks for a delicious (and easy) recipe! I’m now subscribed to your feed for more where this came from. Cheers! I am going to try making the peanut butter no bake cake and cookies they look delicious and mouth watering. 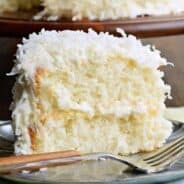 Thanks for uploading the recipes. If they don’t turn out right i will have fun with the kids making them. While your recipes look delicious ,could you please tell where you can buy ingredients like creamy peanut butter and vanilla cream . I tried this as a pie, I used chocolate wafer and honey graham crackers as the pie crust and put a little homemade whip cream on it, it was to die for! Did you use dark or light corn syrup and what % milk do you use? I used light corn syrup and skim (fat free milk)…that’s what I had on hand. Any % milk should work just fine though! I’m confused about how you fit six Graham crackers in a 9×9 pan? What would be the amount of each ingredient if I made it a 9×13 pan version? Thanks for writing such a nice recipe. I love to eat chocs cakes and definitely try this tomorrow at any cost.